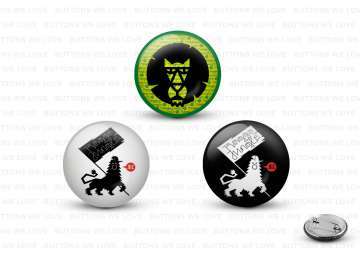 We have new exclusive buttons with black RAGGAJUNGLE.BIZ-lion, green outline and yellow background (1), RJ.biz-logo black on white background (2) and RJ.biz-logo white on black background (3). All buttons are round and in size Ø 25 mm with safety pin. Due to the wide, recessed surface in the lower part of the thin safety pin can be excellent close and open. The film protects against moisture and is not containing PVC.